New Orleans Saints tight end and former Eagles player Clay Harbor. A man who used to catch passes for the Philadelphia Eagles will now compete to win Becca Kufrin's broken heart. 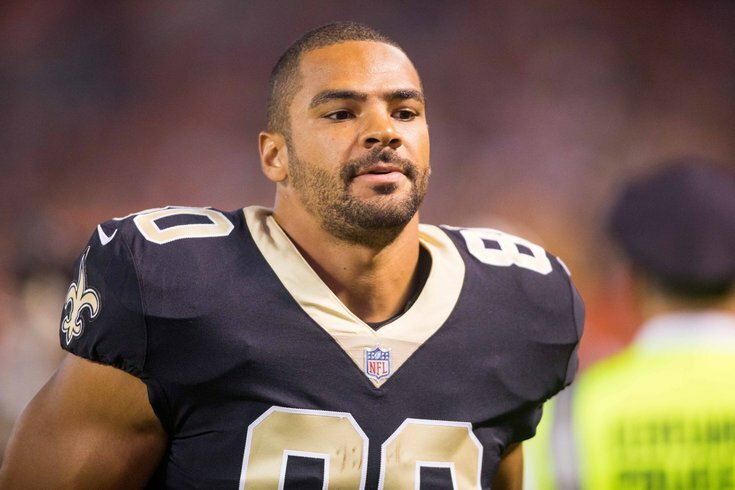 Clay Harbor, who played tight end for the Birds from 2010-2012, is one of the contestants on the upcoming season of "The Bachelorette," according to Reality Steve. Harbor posted a picture of Becca on his Snapchat during the season finale of "The Bachelor" Tuesday with a heart drawn around her. Harbor, 30, has also played for the Jacksonville Jaguars, Detroit Lions and New England Patriots. He's currently on the roster of the New Orleans Saints, but didn't play this past season, as he was placed on injured reserve in August. During his tenure with the Eagles, he caught 47 passes for 421 yards and 4 touchdowns. Just going by sheer numbers, Harbor will certainly have some tough competition. In total, there will be 25 men. Only five have been announced for the upcoming season with Becca, who was unceremoniously dumped after accepting a proposal from the most recent "Bachelor," Arie Luyendyk Jr. The announced contestants include a live horse, banjo man, accent man and two other guys I don't remember. On the flip side, having football ties may be a good thing. Jordan Rodgers, brother of Packers quarterback Aaron Rodgers, won season 12 and got engaged to "Bachelorette" JoJo Fletcher. Jordan, who played quarterback at Vanderbilt and bounced around some NFL practice squads, is still with JoJo after more than a year, so things appear to be working out. Finally, not being a big dumb baby man is likely an advantage, too, considering what Becca's been through. The new season premieres at the end of May.